A tropical oasis of white sandy beaches, lush palm trees and sparkling waters awaits you at InterContinental Hotels - Hayman Island Resort. This private island is located in the Whitsundays, in the heart of the pristine Great Barrier Reef. Guests can experience elegant resort living in luxurious and modern accommodation, with all rooms featuring a private balcony and sea or garden views. Free WiFi and complimentary breakfast are included. The spa is a blissful sanctuary, dedicated to personal pampering including facials, body wraps and massages. Also on offer are a state-of-the-art fitness centre, tennis court and swimming pool. The resort features 5 restaurants with Italian, Asian and modern Australian cuisines. For a private dining experience you can enjoy a romantic twilight dinner or gourmet beach picnic. Hayman Island is a scenic 55-minute boat cruise from Hamilton Island or a 15-minute flight by helicopter or sea plane. Inter-island excursions, and diving, snorkeling and fishing adventures can be arranged. 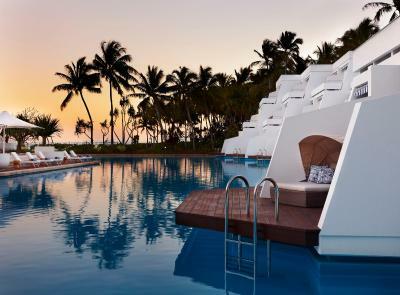 InterContinental Hotels - Hayman Island Resort has been welcoming Booking.com guests since 18 May 2010. When would you like to stay at InterContinental Hotels - Hayman Island Resort? This luxury room features a four-poster bed and floor-to-ceiling windows with ocean view. The ensuite bathroom comes with a separate bath and dressing room. This one-bedroom suite has views of the Hayman pool and Coral Sea from your private double balcony. Featuring a separate spacious lounge area, the suite comes with a separate bath and shower and a dressing room. 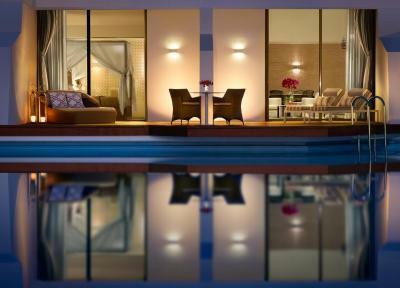 This one-bedroom suite offers direct swim-out access from your private balcony to the stunning Hayman pool. It features bright living interiors, a king bedroom, dressing room, ensuite with separate shower and bath, and open-plan lounge room. This one-bedroom suite offers uninterrupted views of Hayman Beach and the Coral Sea from a private double balcony. The one-bedroom residence features an opulent king bed, ensuite with separate shower and bath, dressing room and contemporary open-planned living area. This room features an open-plan living space, a private alfresco courtyard, an outdoor shower and a double or twin bed. The bathroom has a separate shower, and a bathtub. House rules InterContinental Hotels - Hayman Island Resort takes special requests - add in the next step! InterContinental Hotels - Hayman Island Resort accepts these cards and reserves the right to temporarily hold an amount prior to arrival. There is no airport on Hayman Island. Guests arrive via Hamilton Island then take a boat transfer or sea plane, to and from Hayman Island. The charge is AUD 210 per person each way from Hamilton Island to Hayman Island. Please note, it is a mandatory requirement that InterContinental Hotels - Hayman Island Resort receives flight and travel details 14 days prior to arrival. Without this information, transfers will be subject to availability and may incur additional costs. Please contact the property for further information using the contact details found on the booking confirmation. Aircraft and Helicopter transfers are also available on request and are subject to availability. Additional costs apply. Please contact the property for further information using the contact details found on the booking confirmation. Hayman Island return luxury boat transfers can be purchased as a through-fare via Jetstar, Qantaslink or Virgin Australia. Boat transfers can also be booked directly with Hayman Reservations at AUD 210 per person each way from Hamilton Island to Hayman Island. Please inform InterContinental Hotels - Hayman Island Resort in advance of your expected arrival time. You can use the Special Requests box when booking, or contact the property directly with the contact details provided in your confirmation. We need at least 5 reviews before we can calculate a review score. If you book and review your stay, you can help InterContinental Hotels - Hayman Island Resort meet this goal.